Speed and agility training equipment are useful tools that can help any athlete improve their ability to sprint fast and change direction. They can also help the athlete develop the ability to brake suddenly and perform sport-specific skills effectively at speed. It’s a fact that nine times out of ten, the teams or athletes with the most speed will win. It is probably also true that the biggest myth in sports at the moment is the belief that you can’t coach speed. It is true that genetics can give certain individuals an advantage. But I am here to tell you that with right tool and know-how, you can teach any athletes to run faster and make serious improvements to their multi-directional speed and agility capabilities. Over the last few years a number of tools have been introduced to help coaches implement there knowledge to athletes with greater ease. Some of the most effective of these tools are speed and agility training equipment. They provide coaches with very specific solutions to very specific training needs. 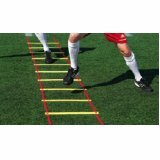 Using agility ladders is an excellent way to practice footwork drill and improve your foot speed in addition to developing coordination and agility. They are normally made from hard wearing plastics and many will be designed with adjustable rungs to allow for variations in foot speeds and exercises. Ladder will come in a variety of length and can be transported easily and can be used indoor or out door. In sports where speed across the ground (absolute speed) is important, agility ladders will help to develop the neural component of their training program. But it is sports where movement speed and quickness is important then agility ladder training come into there own. So, all sports can and do benefit from the use of this type of speed and agility training equipment. The use of mini hurdles is a personal favourite of mine. They allow the athlete to develop quick knee lift and a quick step. They are made of durable PVC tubing and come in a variety of heights ranging from 6 – 18 inches. 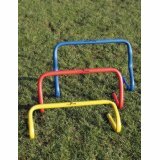 Mini hurdles are light and portable and from a safety angle, they fall over easily if contact is made with them. You can set hurdles apart as desired for agility drills, running drills or plyometric training. They can also be used for forward or lateral movements. Bungee cords are used to induce an over speed training effect on the athlete. It is sometimes referred to as harness running. Bungee cords are made of high quality rubber bands and can come in a variety of lengths ranging from between 2-10 meters. Normally, the bungee cord is hooked to the waist of two athletes. One athlete will tow the other but depending on the length of the cord, athletes will either need to be close in sprinting ability (2m-4m cord) or the partner sprinting ability would not matter if the cord length is 10 meters. The over speed effect is achieved by the front runner walking out several steps ahead of the back runner to get tension in the cord. Both runners then sprint out and as the cord contracts it propel the back runner at a faster rate than the front runner (faster than they are voluntarily capable of generating themselves). Bungee cords are capable of comfortable stretching up to double its resting length. It is also possible that over speed training with the use of bungee cords can be used for agility work at super high speed and so can be a very useful piece of speed and agility training equipment. 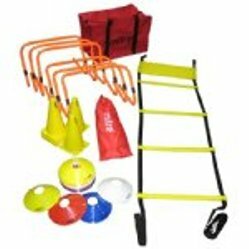 These are just three of my favourite speed and agility training equipment and there are a lot more to chose from, you should take a look and see how they benefit you. From "My Favourite Speed Agility Training Equipment" Back To "Faster, Stronger, Better – Your Shortcut To Improved Athletic Performance"